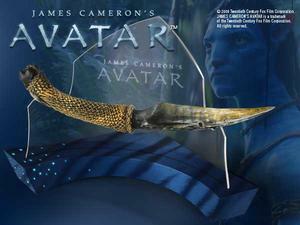 This prop replica re-creates the Na'vi dagger wielded by Jake Sully's alien alter-ego in James Cameron's Avatar. Measuring over 13" in length, the dagger features a detailed grip and blade that replicates the natural claw or tooth of a Pandoran beast. Included is clear display stand with solid base, for which to show off this 1/1-scale replica.